REMOTE CONTROLLER WITH PUSH BUTTON, AND ON MACHINE. COMES WITH ENOUGH 'SMOKE JUICE' TO OPERATE SEVERAL HOURS. WILL PROVIDE 1500 CU FT (A SMALL ROOM) PER MIN. 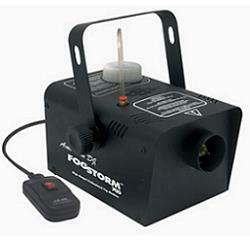 * Please call us with any questions about our fog/smoke machine rentals in Sedona, Cottonwood, Camp Verde, Prescott Valley, Chino Valley and surrounding metro areas.